The cymbal is the second most played aspect of the drum set. 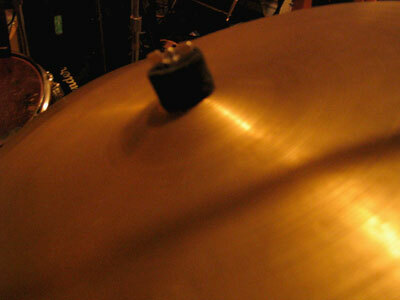 Dictionary.com describes this as: a concave plate of brass or bronze that produces a sharp, ringing sound when struck: played either in pairs, by being struck together, or singly, by being struck with a drumstick or the like. The truth is, there are many MANY different types and sizes of cymbals – ranging from 6 inches – 30+ inches. They are one of the most widely used instruments in the world, offering many different feels to all different styles of music. Most drum sets include 3 basic cymbals – a set of hi hats, a crash, and a ride cymbal. These are the most common on a basic drum kit set up; however the list of possibilities is endless. Splash cymbals, effects cymbals, china cymbals, gong cymbals, are all examples of the variety you can get. The sound of a cymbal is changed by the size, thickness, and shape of the cymbal itself. Some are even known to contain small beeds, or holes to change the sound even more. Cymbals will eventually get dirty and warped, so check out this small article on cymbal care!